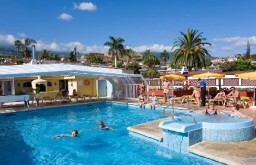 You can get a free shuttle bus into the centre of the Puerto De La Cruz from the Perla Tenerife hotel so you can get into the resort centre with ease to use all the different shops and activities that they have on offer, and also to visit the great range of bars and restaurants that there are there. The hotel is situated on a very nice traditional looking street in a comfortable and quiet part of the resort and offers a peaceful holiday experience for all their guests. In your room you’ll have your own private terrace or balcony for sunbathing or relaxation and your own ensuite bathroom. The pool at the hotel is a very major feature and offers loads of space for guests to sunbathe on the terrace or have a snack by the pool from the bar or have their meal from the buffet restaurant on the terrace overlooking all the surrounding area. There’s a sauna onsite for extra relaxation options or a Jacuzzi pool. Perfect for those who want a relaxing holiday that doesn’t invite any stress or problems during your stay- simply a nice quiet hotel where you can relax in peace.